Patti wrote: I posted these very early in this discussion and you were in agreement with the colored ridges as matching on all three prints. Patti wrote: The horizontal plane on Disney's print consists of these ridges. Above these ridges is the central pattern. Above the central pattern the ridges return to flowing from one side to the other. No, I can only say that about the orange and green ridges. The pink and the light blue ridge are already involved in creating what I described earlier as the LARGE TRIRADIUS (one could also say that is made by 3 triradii), and therefore these can not be considered as belonging to the horizontal plane because obviously the pink and the blue are not just simple ridge lines: they are involved in creating patterns . Patti wrote: The 1933 print is the one where you would like us to not see the white space and not see the dark horizontal spot that connects the two upthrusts. Even disregarding the 1933 print in this example, it is obvious in the darker 1937 print there is a tiny upthrust visible from the top horizontal plane ridge. Tented Arch of the 1st Type. An angle. No, that tiny line appears to merge with the next ridge line. So, even if it had been on the HORIZONTAL PLANE, it would not make an 'upthrust'. Instead, it could be described as the upper ridge line of a triradius. Patti, your assocation regarding the 'tented arch of the first type' is... weird. Basically it is even a fundamental mistake to make this association (sounds a bit like the example that I described for palm readers who claim to have found an arch below a loop). 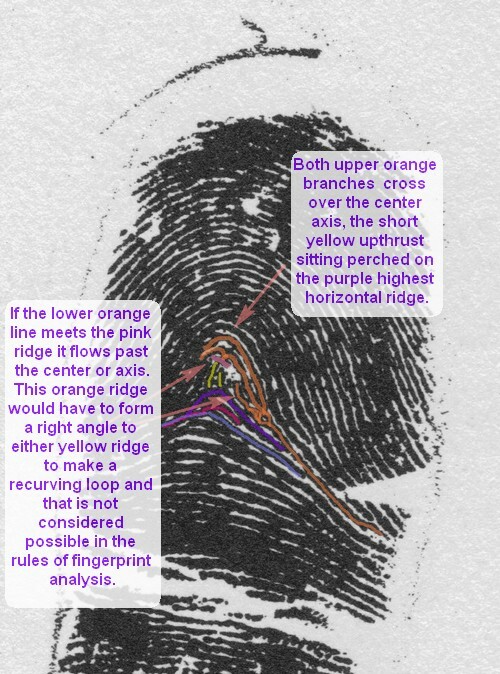 Because that the type 1 'tented arch' really requires that there is no triradius in the fingerprint at all (+ additionally: no loop, whorl, etc.). Patti wrote: In the lighter 1937 print, this tiny angle is seen as abutting the ridge with the crescent moon shape on top. An angle. Tented arch of the 1st Type. 'Tiny angle'? 'Crescent moon shape'? What 'angle'? And again: 'tented arch of the 1st type'? ... Sorry Patti, I don't understand what you're trying to say here. Patti wrote: In the 1933 print, you can choose to fill in the white space, eliminate what you think are ink smears and the print still conforms to the rules of a Tented Arch. Wow... these words actually sound like a 'glimp of hope', because this could mean that that you have slightly changed your position. Does this implicate that you can actually agree that we can safely ignore the LARGE WHITE SPACE in the 1933 print. And do you now agree that we can safely assume that there should have been at least a part of a ridge line visible in that LARGE WHITE SPOT? Patti wrote: Please Martijn, respond to this post and if you need to change the subject or shift the perspective please do so in a separate post. Patti wrote: "The Science of Fingerprints"
Patti, it is important here to notice that an 'apparent upthrust' ... implicates that the upward turning ridge line is formally not assessed as an 'upthrust' (despite that it may look as an 'upthrust'). And I have explained that exactly in my comments: in example 156 we can see an 'independent upthrust', but there is only an 'apparent upthrust' in 155... which is formally not assessed as an 'upthrust' because it is NOT independent. I wave away your suggestion that I am 'the one' who is confused. While you are still faced with that you assessed 'two upthrusts' in the Disney fingerprint... while both examples do not meet the 3-criteria that we have discussed regarding with the examples 155 + 156. 3 - independent line (e.g. this obviously implicates that an 'upthrust' can never manifest as line which ends as a merging with another line). Amazing how you keep coming up with new concepts to spoil the tented arch and manifest a loop. Regarding you newest theory that a tented arch cannot be formed from a triradius - please explain why the FBI sees figs. 141, 148, 149, 154 and 178 as tented arches. All rise from a triradius. Wow Patti... thanks again, this is the very first picture in 4 days where you agreed that we should better follow a line going through the WHITE PATCH in the 1933 print. 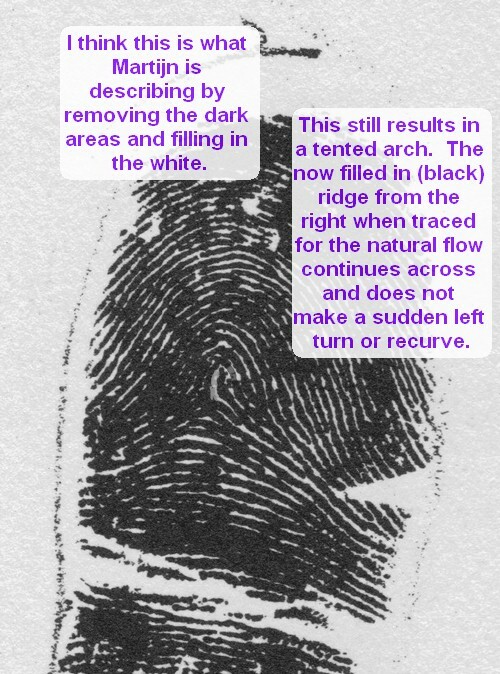 Yes, but when you follow the rules and follow the natural path of the completed in black ridge it flows over the top toward the left side of the fingerprint and does not recurve. Studying the ridges you colored in orange, I also notice none of them create a loop. Patti, I never proposed the theory that you just described. You have misread my words completely!! You raised the topic of the 'type 1 Tented arch'... which concern the type where there is no triradius at all, only at least one ridge line (in the horizontal plane) which has an of 90 degrees or less. - The type in which ridges at the center form a definite angle, e.g. 90 degrees or less." Patti, maybe your brains are getting overheated...??? No problem. I thought you were saying it couldn't be part of a triradius. Yes, angle would be more than 90 degrees on one side in Disney's print. There are examples of tented arches with the upthrust leaning. I don't get why this makes any difference. A tented arch doesn't have to follow all the rules of all three types. All the rules help eliminate the possibilities of being mistaken. But still, the abutted rising ridge does not recurve. You would have to add or remove more ink to create your curve and at that point there really is too much creative expression involved. The rule of following the natural flow dictates now. Patti wrote: I love you Lynn but you have a reputation for being polite and diplomatic at times like this and staying conveniently on the fence. Me - I just go out there and ruffle feathers calling it like I see it. I love you too hon. I'll take my 'reputation' as a compliment But it isn't true! When I have a strong conviction about something I voice it .....Don't you recall the tented arch vs loop discussion on Sue's forum (which this thread reminds me of). I too am "calling it as I see it" - 1937 picture looked like a radial loop, 1933 looks like a tented arch. But there are some aspects of the 1933 pic that I find confusing. And if it is a tented arch, why does it look like a loop on the other pic. I just can't be sure what type of print it is, which I don't think is the same as "staying on the fence". 1) Mickey can here better be described... as a 'whorl', and his hat is 'your tent'! 2) NOTICE: The 'whorl' (= Mickey) is STANDING on THE horizontal plane... and 'your tent' (= Mickey's hat) is standing on the 'whorl'. Conclusion: 'your tent' is not on THE horizontal plane, and can not be called an 'upthrust'. Patti, the fundamental mistake in your comment about this Disney picture is here that you are talking about... "a" .... horizontal plane - as is if a horizontal plane can be found at ANY location in a fingerprints. 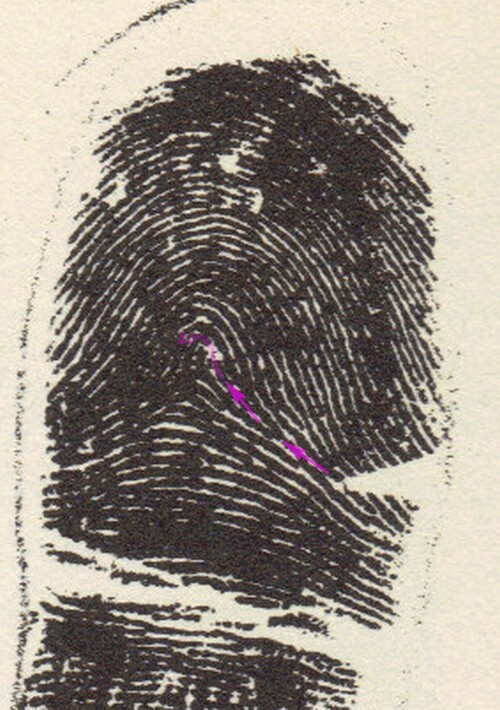 But there is only one horizontal plane in every fingerprint, because the truth is that THE horizontal plane is always ONLY be found at the bottom-side of any fingerprint. 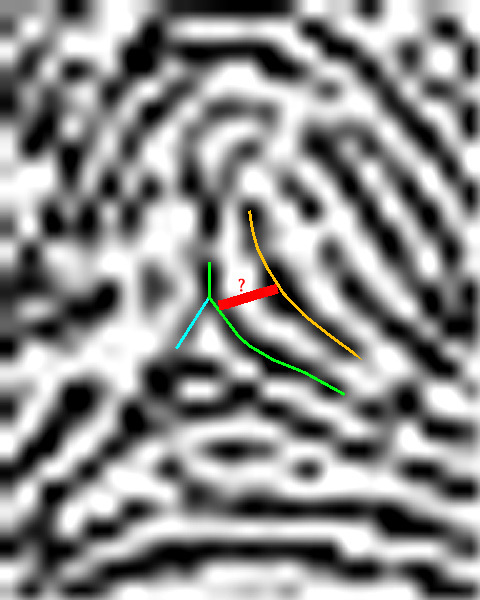 Therefore in this case the 'hat' becomes completely irrelevant because it is found at the position on top of the whorl. This picture is 'whorl', and an 'upthrust' can not be positioned on top a whorl...!! Because what I just described relates to a common mistake that is sometimes made by 'palm readers' (not you Patti)... because sometimes they are talking about that the claim to have found an 'arch' below a 'loop' pattern. But they make a likewise fundamental mistake like you did, because 'their arch'... is actually a part of the 'loop'... for their are actually talking about the horizontal plane! The way I see it, the rim of the hat is the curving horizontal plane and the body of the hat is the tent arch. I'm not sure what Mickey's standing on, but its so far below the tented arch, it could be a rascette. Patti wrote: ... You would have to add or remove more ink to create your curve and at that point there really is too much creative expression involved. The rule of following the natural flow dictates now. Well Patti, you are right that removing ink needs to be done very carefully. Because obviously, due to the abundance of ink the ridges are way too wide... which is the reason that in the zone of the '8 pointed stars' we can hardly follow any ridge path. Regarding the result of your efforts to delete three inkdots, I can see where you deleted the three INK DOTS (at those regions the print is still a bit more gray) - but I can also see that you also deleted a (small) part of the ridge line on the left side (see the picture below). A ZOOMED version of the light 1937 print that I presented earlier. So, your result after deleting the 3 INK DOTS (+ some part of the ridge line on the left) became already an example of 'creative expression'!! And therefore I would not recommend to draw any conclusions from your attempt to delete some INK DOTS!! Actually, your attempt to delete some clearly identifiable INK DOTS.... confronts us again with that basically there is simply too much ink involved in this print to follow most of the individual ridges in the center of the 1933 prints. Patti, I think there is no way out of this problem if we continue to focuss on this 1933 print alone (like you described: if we focuss solely on the 1933 print, it is hardly possible to delete any ink without using 'creative expression'). Especially the light 1937 print is suitable for identifying the path of quite a few of the ridges near the center (and in the zone of the '8 pointed star'). Because that is the only picture where we can follow most ridges relatively easy. Yes, we also know that the light 1937 print has some flaws because there are a few 'strange' large white zones. But for those zones we can use the other two prints again to find what is really going on in those zones, etc. I'm looking forward to you drawing for us this creative project. The lines marked in red are already agreed on in earlier posts. 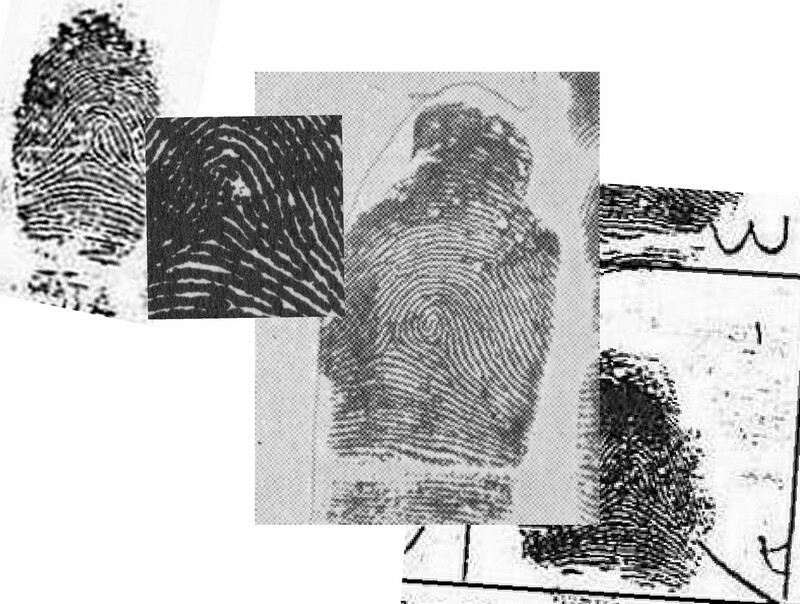 Note where the blue feature is found in all three prints. You can count ridge lines in all directions and will end up at the same place on on three prints. The bottom of the crescent shape in the one 1937 print is actually part of the horizontal bar that crosses the upthrust. It can be undoubtedly traced. Just count the ridges over the top and downwards. Look at the location in all three images and the location above the pink dot at the axis. Axis drawn in two images via lines through 4 prints. Horizontal plane on left side of images. Vertical line is drawn down from the 'double' fork commonly seen in all three prints down through the axis. How could these axis-analysis relate to what we are trying to do: to asses the fingerprint type only!? 2 - And I noticed with bare-eyes that the axes + some of the other points that your marked.... are not always founds in the same location of the 1933 print + the two 1937 prints. And my observations are confirmed when considering ZOOMED versions; you could have avoided these errors by using ZOOMED pictures. - 1ST PICTURE: You told me that you understood my point about the MIRROR-effect when comparing the fingerprint of the right index finger with the fingerprint of the left index finger... but your axis-picture proofs that you didn't understand my point because you should have MIRRORED the fingerprint of the ring index finger to compare it with the axis of the left index finger. - 2ND PICTURE: Second, I can see with bare eyes that you managed to draw the axes crossing at the same point in both 1937 prints... but in the 1933 print you are using a point that is about 1 ridge line lower!! This again demonstrates that you're not able to find the similar features in that 1933... and obvious that is the result of the abundance of ink in the zone of the '8 pointed star'. - 3TH PICTURE: I can not understand that you keep drawing lines in UNZOOMED pictures; I can see again with bare eyes that in the picture you did not put the 'blue mark' and the 'purple dot' at the same postion for neither of the two 1937 prints, and also not for the 1933 print. 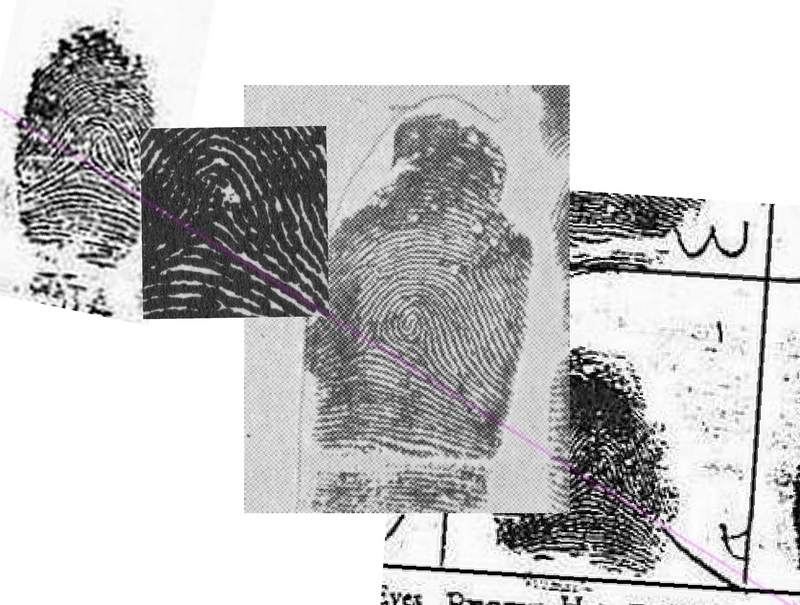 - 4 TH PICTURE: I am wondering... why didn't you add the fingerprint of the right index finger for the vertical-axis analysis? 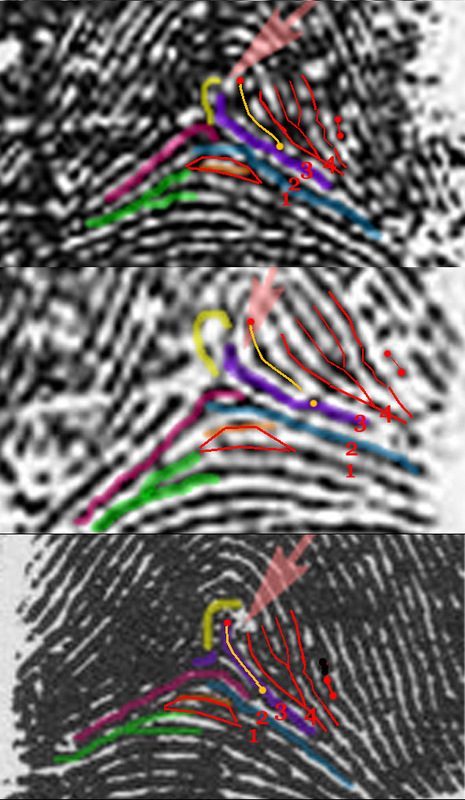 I think there is an obvious reason: the triradius in the right index fingerprint is positioned at a relatively large distance from the core (of the whorl), and this applies for both triradii... so even MIRRORING that picture would change anything about that. Edit: Sorry, I had not planned to produce any picture that includes an attempt to delete ink.... because I agreed with your comment that deleting ink is hardly possible without 'creative expression' (I suggested that there is one alternative.... but that would require the inclusion of the two 1937 prints as well). 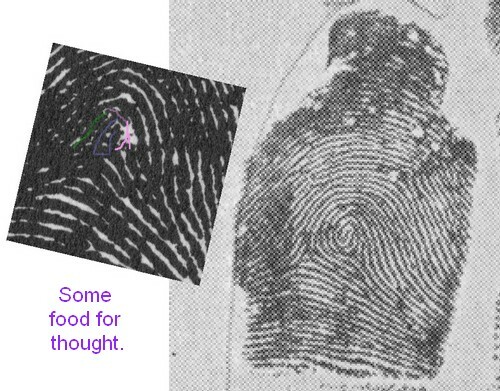 I think one axioma in fingerprint analysis is that one should make an assessment based on adding CHANGES in a fingerprint (especially when the method includes 'creative expression' which you mentioned in the perspective of your own attempt to delete ink). I can still see where I thought the loop was, but it's confusing...with the black spots & white patch. 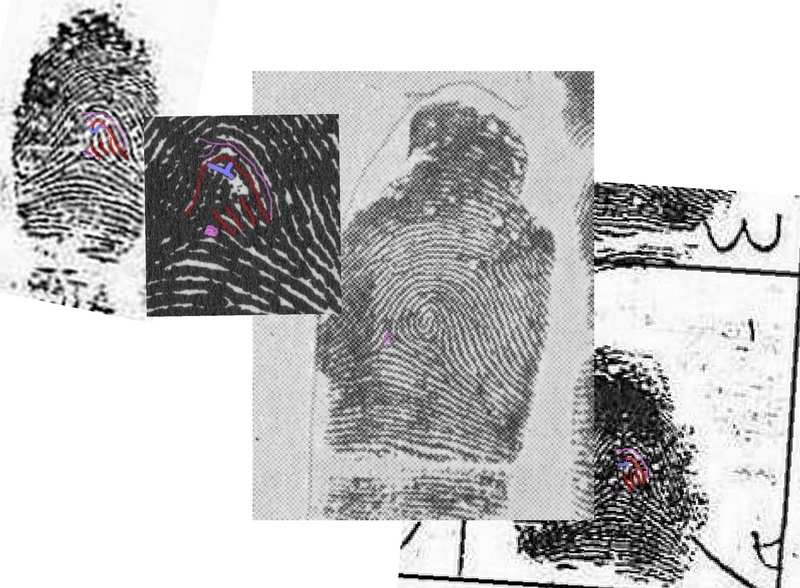 The essential point of my analysis is that the radial loop is confirmed IN THE INK that we see in all three of Disney's fingerprints that we studied. This essential point is illustrated by the picture below that I presented earlier; the 'white path zone' is an exception but we sort of agreed that we can (fairly) assume that there is a ridge line in that zone. 5) and finally it merges with the golden line. I agree adding and removing ink totally ruins the accuracy. That is why matching coordinates in all three prints is an excellent alternative. Comparing to the other index finger give us the natural genetics. An ulnar loop on one index is a mirror of an ulnar loop on the other index finger. Therefore, a radial loop on one finger and an ulnar loop on the other is a mirror - reversed. The radial nature negates the need to mirror. Also, the easy fit of both index fingers to match along the horizontal plane is obviously helpful. The abutting ridge forming an angle is apparent in all three prints if you use accurate coordinates and count ridges. Once you have absolute matching coordinates, which I have shown and will continue to illustrate in my next post, you can easily discern what is in the 1933 print. 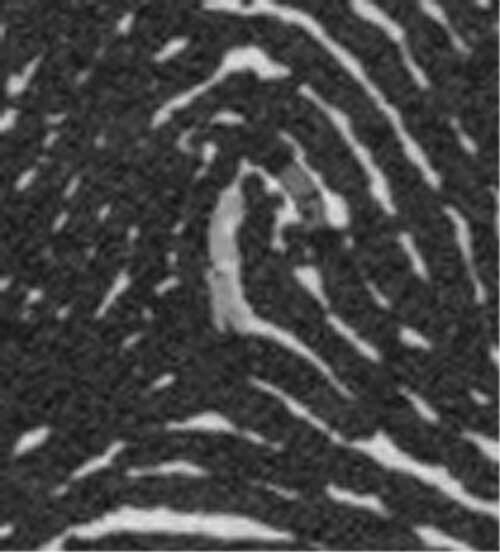 The right index fingerprint supports the natural flow of the pattern - which matches in both index fingers. There is no loop. The genetic code was all about a whorl and it failed to form, resulting in a configuration that can only be classified as a Tented Arch. PS. I will now first wait for the outcome about what you have in mind. p.s. Remember zooming is a creative process. It is better to start with the largest and best quality you can. The process of zooming a black and white graphic results in the software "choosing" how to fill in adjacent spaces as it enlarges. When it's confused as to whether to make a black dot or white dot it will make a grey dot. Then if someone afterward uses the sharpen tool, the software "chooses" which edges to trim to smooth out the edge. So, I don't think we will disagree on coordinates. My mouse is a roller ball type and my hands are less agile than they used to be so it is difficult for me to draw perfectly. I'm also at the mercy of the process of using one software tool (Print Shop) to put all the images on the same page and save as a jpeg, then another to crop the image at the highest quality and add text. Each process takes a little quality away and tends to blur the colored added lines. I'll upload my next diagram shortly, I'm in the process of putting it together. Patti wrote: p.s. Remember zooming is a creative process. It is better to start with the largest and best quality you can. - I agree that ZOOMING does implicate that the software makes some explotions, but that is according mathematical rules. So, this is basically not much more than a theoretical consideration. - Any human attempt to delete ink is certainly not done according mathematical rules... especially when the person refuses to consider other prints available. But your idea of matching coordinates (between the 3 prints) doesn't require to delete any ink at all. So, your criticism regarding ZOOMING doesn't really make sense, because there is simply no 'subjective' human influence involved in using that method of research. To understand this properly, you should for example become aware... that the excellent quality of the mathmatics involved in the programs, helped your to present a very large high quality version of the 1933 print! The magnification was done with same kind of mathematics that are involved in ZOOMING. 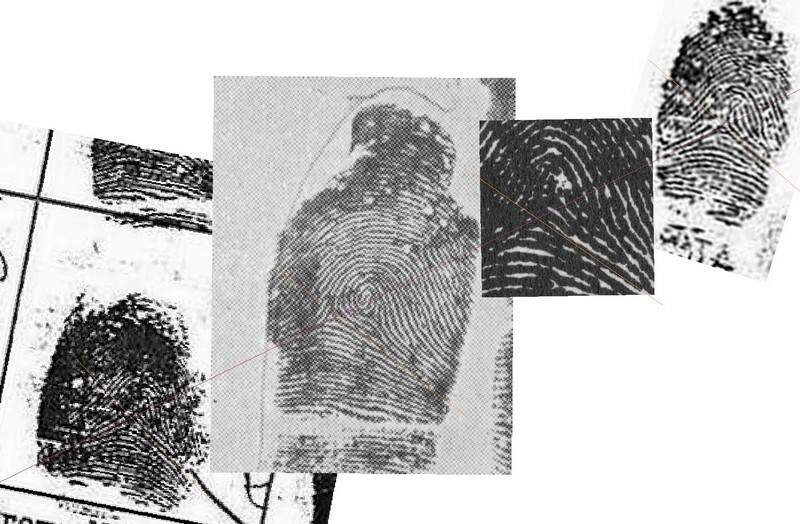 Forensic researchers also use computer programs to identify essential points in a fingerprint, and these programs use a method which basically includes the same mathematics rules that are involved in ZOOMING. Patti, your bare eyes can not compete with those mathmatics! And neither can my eyes! !